Snowboards have come a long way since Jake Burton began designing them way back in 1977, reflecting changing trends and approaches to riding. That's why our best snowboards buyer's guide features a variety of types and considers different skill levels and styles of riding. So whether it's the tapered sexiness of a carving snowboard, a park-friendly twin-tipped mean machine, or a board made especially for kids, you'll find them all here, ready to ride this winter. From budget-friendly boards to pro rides, there are some incredible buys to be had, depending on your skill level and the type of riding you do. Our top choice for best snowboard is the Ride Burnout, designed to perform in all conditions. It's designed for freestyle snowboarding on any terrain, making it truly versatile and a thrill to ride. It won’t break the bank either if you’re looking to move up from your existing board. What are the different types of snowboard? All mountain: designed for all-round use, these snowboards have a more directional shape. In most cases, this means a narrower tail. Freestyle: light and flexible short boards for riders who love hanging out in snow parks. Alpine: long, stiff snowboards designed for carving down the mountain. This board typically has a flat tail and a 'shovel tip' only at the front unlike a freestyle board, which has one on both ends. First things first, unless you're a seasoned pro, always seek out expert advice – staff at the likes of Snow and Rock, Boardwise and the Snowboard Asylum have ridden a wide range of snowboards and can offer advice about the features that will best suit your style of riding. The other reason to seek out expert advice? The lingo. And we're not just talking about camber (the board's upward curve), core (the material – usually wood – between the base and the top sheet) and torsional flex (the flex across a board's width). Subtle changes to a board's design can have a huge effect. For example, a rockered (raised) tip and tail gives the board a floatier feel, while a higher degree of edge bevel reduces the risk of catching. This is especially handy for park riders keen to avoid a face plant! The sheer range of snowboard brands is another reason. Brands like Burton, Salomon and K2 have been around for years and have a brilliant reputation, but don't dismiss younger brands such as Jones, known for their innovative approach to board design, and Yes, a brand founded by three of the world's best riders. This is the piece of wood Billy Morgan was riding when he bagged his bronze in the big air competition at the last winter Olympics, but that doesn't mean it's only suitable for those keen to throw themselves off chunks of sculpted snow. Our top pick for the best snowboard has a twin hybrid camber: a-well balanced amount of both camber and rocker. A quick lesson in snowboard design: camber refers to the gentle upward curve in the centre of most snowboards. Rocker refers to the opposite – a fully rockered board will have the shape of a banana. With the Burnout, the combination of both means it works just as well in the powder as it does on jumps and rails. Strategic placement of carbon stringers – long, thin strips of material used to give board strength and elasticity – also make the Burnout wonderfully responsive. Cleaved steel edges help keep it in tip-top condition, no matter how many rail slides you tackle. The Burnout feels refreshingly solid, enabling you to tackle bigger tricks and tougher terrain without fear. The combination of woods (aspen, bamboo and lightweight Paulownia wood) also creates the perfect balance of strong and light. This Salomon stunner takes the second spot in our best snowboard buyer's guide because it's epic to ride and designed with big air in mind, though in truth there's little it can't handle. A low swing weight – the result of the blunted nose – makes it easy to control, both in the air and on the ground. A generous amount of camber gives it some serious pop and its medium flex allows for just the right amount of flexibility. Call us fickle, but we love the graphics too. Salomon's second snowboard in our list has enough pop to make it a fantastic option for snow parks, but it's also an incredibly smooth ride. In other words, it's ideal for intermediate riders who are competent enough to tackle everything from rail-filled parks to groomed pistes and tree runs. An Aspen Strong Core guarantees stability, enabling you to step outside your comfort zone with confidence. The position of the Rock Out camber, situated beneath the feet, makes it super stable, enabling you to tackle more challenging terrain with confidence. Jones is a relatively new snowboard brand giving the big guns a serious run for their money. Without question, this is the best snowboard for kids and young riders who have learned the basics. It's made with the same materials used in adult-sized boards. The blunted nose is an unusual feature for a kids snowboard but it makes perfect sense, as it allows for more manoeuvrability in the air, while the twin tip-style ensures it’s just at home on the piste. Another advantage is the extruded base, made by melting polyethylene pellets together. These are less porous and easier to maintain and repair than sintered ones (made by crushing pellets together under high pressure) and they require less waxing. Slightly oversized steel edges allow this board to take some serious knocks without sacrificing performance. Lastly, the sidewalls of snowboards are usually made from ABS plastic – not great for the planet – but Jones uses only recycled plastic, making this a great eco-friendly choice. The wide nose and waist of this board ensures you'll float effortlessly over powder, while the camber makes it brilliantly responsive. A shorter effective edge results makes this a board which reacts quickly and provides an incredibly fun ride. It's a board for riders who want to love every run. It performs fantastically at high speed and at a slower pace, thanks to the combination of camber and a tapered tip. That partnership also makes it more versatile than many carving boards. K2's skate deck-inspired Bambooyah core is basically a centre made from cross-layers of bamboo and fibreglass ply. It offers riders the best of both worlds: the lightness of bamboo and the toughness of fibreglass. This results in a snowboard that can take its fair share of knocks, but which is great fun to ride. Its wider and shorter design gives it more manoeuvrability than many of its rivals, but a carbon-infused sintered base (which basically means less drag) ensures it's still lightning quick. This board is a great option for park lovers. The blunt nose allows the board to float above the piste while reducing its weight. Jones' traction tech (multiple contact points along the edge of the board) improves grip and enables riders to slice through snow. This is incredibly useful in less-than-perfect conditions. We also love the side cut, which is incrementally increased as the edge reaches the contact point. This makes turning much easier. Elsewhere, the Bio-plastic top sheet is made from castor beans, an ultra light material that reduces the chances of snow and ice building up on the surface of the board. Feeling guilty about the carbon emissions resulting from your flight to the mountains? 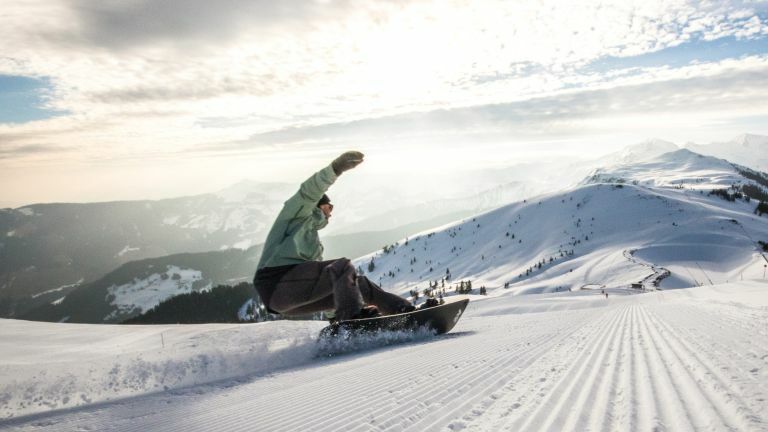 This snowboard will offset some of that guilt, as Jones is a member of the 1% For The Planet organisation, which requires its members to meet strict standards relating to everything from materials to energy output. The brand's boards feature environmentally-friendly materials such as bamboo, castor beans and recycled plastic. This snowboard is designed to push beginner riders onto bigger things, without giving them a huge snowy shove out of their comfort zones. The symmetrical shape adds up to an easy, enjoyable ride, with a soft, directional flex making it easy to control in any condition. The Burton channel system has been around for a few years, and beginners will love it. Why? Bindings are mounted on two thin channels, rather than two plates attached to the board. This system enables you to quickly change stance position; essential for new riders finding their footing. The Burton Ripcord has a softer flex than many other entry level snowboards, so it's more forgiving. It’s one of the lightest boards around, thanks to Burton’s super-light FSC Certified Fly® 900G Core. There are some seriously great snowboards around, and at reasonable prices too. Which snowboard suits you best depends on what skill level you're at and what type of riding you enjoy the most. Our top pick for the best snowboard is the Ride Burnout, which performs just as well in the powder as it does on jumps and rails. It's ideal if you want a snowboard you can push hard, and one that won't need a lot of high maintenance either. For beginners, you can't go wrong with the eco-friendly Burton Ripcord. It's a gorgeously smooth, easy rider, built to help you have fun as you find you feet when snowboarding. Tamara Hinson is a former snowboarding instructor, and now a travel and outdoors journalist who specialises in winter sports tech, among other areas.